Obsessive Compulsive Cosmetics is a 100% vegan and cruelty free cosmetic line. This brand is best known for their ultra-saturated and extremely pigmented products (i.e. Lip Tars and Loose Colour Concentrates). 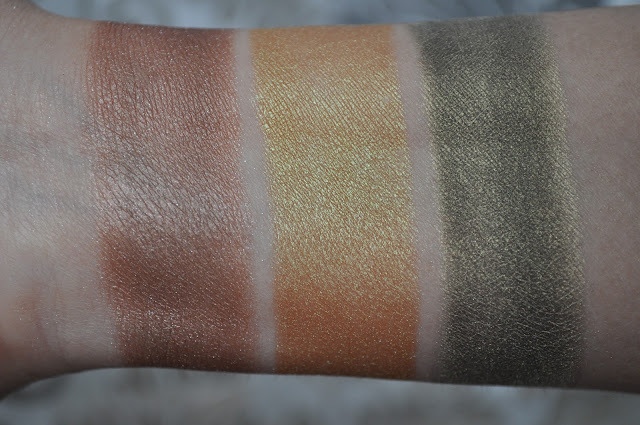 Here are some swatches of the six OCC Loose Colour Concentrates I own. From left to right: Twirl (yes, it's there), Platonic, Clove. 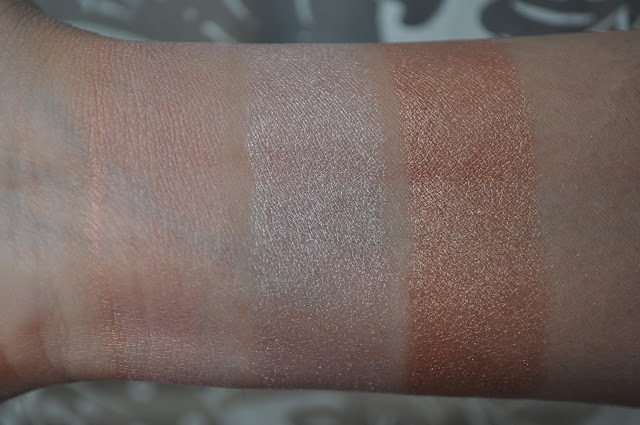 Since Twirl was proving to be the bane of my existence in this picture, I swatched and took photos of it separately. Twirl: A pale peach with a pink duo-chrome. When used wet, the pink duo-chrome is more pronounced. Platonic: A pale icy pink shimmer. Clove: A pale orange champagne. Twirl (wet), here you can see more of the pink duo-chrome. Smote: A taupey reddened copper, but not a taupe! Slag: A red based yellow gold with a green duo-chrome. Lafayette: A grey based murky moss green with a gold duo-chrome. Obsessive Compulsive Cosmetics Loose Colour Concentrates retail for $12.00(2.5g) and can be purchased at occmakeup.com. OCC offers international shipping, but the fees are a bit steep. I would wait for one of their website sales to balance out the fees. Are you OC for the OCC? Very pretty colors! I think I am very turned off by loose powders... after spending an afternoon cleaning up a spilled shadow, I might never go back! Hope it wasn't on the carpet?! ?